2PM( Hangul : 투피엠) is a South Korean boy band formed by JYP Entertainment . The current members are Jun. K (formerly known as Junsu), Nichkhun , Taecyeon , Wooyoung , Junho and Chansung . Former leader Jay Park officially left the band in early 2010.The members of 2PM started when Korean musician Park Jin-young formed an eleven-member band known as One Day. Eventually the band was split into 2PM and a similar but independent group known as 2AM . 2PM debuted with the song "10 Jeom Manjeome 10 Jeom" (10점 만점에 10점, lit. "10 Points Out of 10 Points"), which showcased their acrobatic dance styles.They achieved their first number 1 single with "Again & Again". Both singles featured on their first studio album,The First Album 1:59PM, released in 2009. The band went on to release another Korean album, known asHands Up, in 2011. They made their Japanese debut later that year withRepublic of 2PM. After more than a year, the group returned in 2013 with their third studio albumGrown. In early September 2014, 2PM returned with their fourth studio albumGo Crazy. On 15 June 2015, 2PM made a comeback with their fifth studio albumNo.5. After much anticipation 2PM returned on 13 September 2016 with their sixth studio albumGentlemen's Game. to become part of JYP Entertainment. Some members already had experience in the entertainment industry, including Jun. K , who had won several singing competitions. Ok Taecyeon , Lee Junho and Hwang Chansung had participated in the showSuperStar Survival.Some of the members had previously lived in the U.S., former leader Jaebeom in the Seattle area, Nichkhun in Southern California , while Taecyeon spent seven years in Massachusetts before returning to Korea. captured the group's training days. In this documentary, former member Jaebeom finished at the top spot and received the most fan votes. It also featured the elimination of three trainees from the group: Lee Swichi, Jeong Jinwoon , and Yoon Doo-joon were all cut. However, Jinwoon replaced Im Daehun upon the latter's withdrawal. By the end of the training process, One Day had been reduced to an eleven-member group. The band was then split into four-member ballad group 2AM and seven-member hip-hop group 2PM. Jaebeom was chosen to serve as the group's leader, as he was the oldest member and also the one where all the members acknowledged as the most talented one. He played key roles in several of the band's early singles and associated music videos. 2PM debuted with their single " 10 Out of 10 " (10점 만점에 10점) on 4 September 2008. 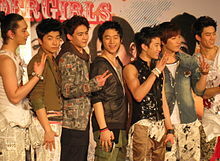 In October 2008, they began to promote "Only You", another song from their debut mini album,Hottest Time of the Day. In April 2009, the group released their second mini album,2:00PM Time For Change, which they began promoting that month. In May they won their first Mutizen Song award onM!Countdown, followed by two more and aMusic Bankaward. On 11 June, 2PM began promotions for "Niga Mipda" (니가 밉다, lit.I Hate You) onM!Countdown. In July 2PM achieved first place on theM!CountdownandMusic Bankcharts for the song "Niga Mipda". On 30 July, 2PM won the 'Only One Song' award onM!Countdown. Park Jin-young confirmed that 2PM would continue on as a six-member group.Due to the sensitive topic of Jaebeom 's departure, 2PM withdrew for several weeks from their appearances on variety shows. The album included tracks voiced by Jaebeom, although his face was excluded from the cover.The group finished re-filming their music video for " Heartbeat ", the title song, without Jaebeom in October 2009. The group began promotional activities for the album on a variety of music shows, including M.NetO Good Concert,KBSMusic Bank, MBCMusic Coreand SBSInkigayoin November 2009. The group paid homage to Jaebeom during their performance of "Again & Again". During the performance, a spotlight shone over Jaebeom's usual position in the dance formation, and his vocals played over the speakers without being replaced. which went on to take #1 on the K-Chart for three more weeks. In addition, "Heartbeat" achieved the "Mutizen" song award Triple Crown on SBS Inkigayo by being the #1 song the Inkigayo "Take 7" chart for three weeks, the maximum amount of time for which a nominated song is eligible to win. On 30 December 2009, at Korean Broadcasting System (KBS)'s end of the year Music Festival, "Again & Again" was recognized as "Song of the Year",winning with 57,060 votes. 2PM's second single from01:59PMwas "Tired of Waiting". The song was performed live for the first time at the SBS Music Festival in December 2009. 2PM's promotion for the album ended with their SBS Inkigayo performance in January 2010. A combined fan meeting and press conference was held two days later with the six remaining members of 2PM and JYP Entertainment CEO Choi Jungwook in attendance. Various 2PM fansites were shut down immediately after the conference as a protest of Jaebeom 's termination. Management announced that although 2PM would move forward with six members, a new leader would not be chosen to replace Jaebeom . , a mini-album consisting of six tracks. The group intended for the release to illustrate a stronger side of themselves than did their previous releases.The group made their television performance comeback on Mnet's music programM! Countdownin April 2010. The song samples K'Naan 's Wavin' Flag . In July 2010, Taecyeon and Wooyoung left their position of MCs at SBS Inkigayo. The next month, Wooyoung also left Winwin to concentrate on 2PM's busy schedule. The 1st concerts took place on 31 July 1 August (in Seoul) & 7, 8 August (in Busan) ( 2AM & Miss A were invited as the guests of the concert). More than 12,000 fans attended 2PM's first concerts in Seoul. 2PM performed all their hit-songs since 2008 plus solo performance from each member. 2PM held two encore concerts in Seoul on 4–5 September to celebrate their second anniversary. .In November 2010,Still 2:00PMdebuted unexpectedly on the 13th spot of the Billboard's World Album-Chart though no promotions for the album were made in the United States. 2PM’s first Japanese concert tour, known as the "2PM 1st Japan Tour 2011 Take Off," began in Sapporo on 6 May and ended a week later in Tokyo. began broadcasting in July 2011 on SBS’s E!TV cable channel and featured all six members. It was the first time 2PM would emcee a program with their name on it. On 30 November 2011, 2PM released their first studio album in Japanese language,Republic of 2PM. It contains all of their Japanese singles released to date (Take Off, I'm Your Man and Ultra Lover) plus the Japanese version of their most recent Korean hit song "Hands Up", as well as a new song composed by Minjun for Japanese fans called "Hanarete Itemo" (離れていても, Even When We're Apart) and 4 other completely new songs. The main point of the album artwork motif is a taste of the 1950s and 1960s. , in Japan.One Day refers to the group from which 2PM and 2AM both split. On 13 April, they released the trailer for the film. The full music video was released on 6 May 2013 along with 10 songs from the album.This album is a two title track album, the track "A.D.T.O.Y." was released on 11 May 2013.
exhibition, at the Apgujeongrodeo Station . It is part of theG+Dream Projectby Gangnam-gu Office for disadvantaged youth. M! Countdownon 16 May, where they performed "A.D.T.O.Y." and "Comeback When You Hear This Song", along with Shinhwa , for their albumThe Classicand Seo In-young for her EPForever Young. The long-awaited comeback that was to be in April was postponed by JYP Entertainment and 2PM due to their individual activities, for early June with a possibility that they will return in July at the earliest or even later in the year. According to ALLKPOP , JYP Entertainment rep told Newsen on the 14th, "2PM's comeback has been delayed for the time being. It will be in the latter-half of this year but the exact date has not been decided yet." They made their comeback performance on m!countdown on the subsequent day. On 4 September the group celebrated their eight-year anniversary together. On the same day 2PM began teasing a comeback by posting individual photos of each member on social media. Their sixth studio album was released on 13 September, titledGentlemen's Gamealong with the new single "Promise (I'll Be)".Gentlemen's Gamewas their last album before they began their military enlistment. On May 8, 2018, Jun K. also entered military. (아이돌군단의 떴다!그녀).The segment ran from 4 December 2008 to 26 March 2009, with a total of seventeen episodes. , in which the members escaped the pressures of stardom by performing ten forbidden activities of idols. The show ran from 21 July 2009 to 1 September 2009, with seven episodes aired; the airing of the final episode, which coincidentally featured the members engaged in a "Leader Olympics" game to select a new leader, was postponed indefinitely due to Jaebeom 's internet controversy and his subsequent departure from the group. In addition, Taecyeon and Wooyoung have been hosting SBS ( Seoul Broadcasting System )'s weekly music showInkigayo, while Jaebeom and Chansung have also made regular appearances on 'Introducing Star Friends'. Since Jaebeom was voted off, Nichkhun replaced his position as the guest. Nichkhun and Wooyoung were also frequent guests on SBS's variety talent showStar Kingbetween April and October 2009, with the other 2PM members occasionally joining them. Member Nichkhun has also been selected by the Tourism Authority of Thailand (TAT) as the face of their newest campaign, "Come to Thailand; Let's Take a Break!" In late October 2009, a commercial film (CF) of 2PM promoting Hanami (a Thai snack company) was released, which also included Jaebeom ; the commercial was said to be filmed prior to his departure in September. 2PM is also currently endorsing Paris-Croissant Food Company 's Paris Baguette bakery franchise, for which the group recorded a special Christmas song and are featured in a series of commercials with popular Korean actress Kim Tae-hee . Members Nichkhun, Taecyeon, Minjun and Wooyoung endorse Cass Beer, and Nichkhun has continued advertising for the Suzuki Jelato motorcycle in Thailand. In addition, 2PM now endorses Calvin Klein South Korea, as well as, most recently, It's Skin, a South Korean cosmetics and skin care brand. Due to renewal of their endorsement deal with Samsung , 2PM recorded the song "Nori For U" for Samsung Anycall NORi . "관객과 함께 호흡하는 '퍼포먼스 보이그룹'2PM" (in Korean). CNB News. 28 September 2008. Archived from the original on 12 June 2009. Retrieved 31 May 2009. "Riding the Korean Wave". Bangkok Post. 15 July 2009. Retrieved 20 July 2009. Secret Four Youtube (8 October 2013). "[PREDEBUT] 060318 Superstar Survival Ep. 01". Retrieved 26 September 2017 – via YouTube. "Archived copy". Archived from the original on 5 February 2011. Retrieved 8 January 2011. Cover story: 2PM. Archived 5 February 2011 at the Wayback Machine. iamkoream.com. Retrieved 8 January 2011. Jung, Sun (2011). Korean masculinities and transcultural consumption : Yonsama, Rain, Oldboy, K-Pop idols. Hong Kong: Hong Kong University Press. ISBN 978-988-8028-66-5. Park, Se-Yeon (9 September 2009). "재범 2PM 자진탈퇴, 마녀사냥 논란 분분 후폭풍 예고 (Park Jaebeom voluntarily withdraws from 2PM, consequence of witch hunting)" (in Korean). Newsen via JoinsMSN. Archived from the original on 23 September 2009. Retrieved 30 April 2012. (in Korean) Lee, Mi-hye. JYP, 2PM 재범 한국비하 공식 사과문 "머리숙여 사과드립니다" (JYP, 2PM's Jaebeom Issues Apology on Korea Comments, "With His Head Hung in Shame") Archived 12 September 2009 at the Wayback Machine.. Joins.com/Newsen. 5 September 2009. Retrieved 5 September 2009. (in Korean) Lee, Eon-hyeok. 박진영 "재범, 2PM 탈퇴는 없다" 공식입장 (Park Jin-young: "Jaebeom Will Not Leave 2PM") Archived 13 September 2009 at the Wayback Machine.. Joins.com/Newsen. 7 September 2009. Retrieved 7 September 2009. (in Korean) Park, Se-yeon. 재범 2PM 자진탈퇴, 마녀사냥 논란 분분 후폭풍 예고 (Jaebeom Announces that He's Leaving 2PM Amidst Surprising and Tumultuous Witch-hunt) Archived 23 September 2009 at the Wayback Machine.. Joins.com/Newsen. 8 September 2009. Retrieved 8 September 2009. Cho, Jae-hyon. '2PM to Take Stage Without Jae-beom'. The Korea Times. 18 September 2009. Retrieved 18 September 2009. Han, Sang-hee. Will Fallen Idol Star Make Comeback?. The Korea Times. 18 September 2009. Retrieved 18 September 2009. 2PM 예능 출연 자제 왜? “팬들에 대한 예의 차원”. Newsen. 15 November 2009. (in Korean) 2PM `하트비트` 노래-마케팅-재범 `대박공식`. MK News. 10 November 2009. Retrieved 14 November 2009. "JYP Hints at Return of Jae-beom to 2PM". Korea Times. 12 November 2009. Archived from the original on 16 November 2009. Retrieved 14 November 2009. Kim Hyun-rok (11 November 2009). "박진영 "재범 2PM으로 복귀할 것" 최초발언". Starnews (in Korean). Archived from the original on 23 November 2009. Retrieved 12 November 2009. 2PM "재범은 영원한 리더"... 재범과 수익분배 Archived 17 June 2012 at WebCite. Hankook. 21 December 2009. 남성 그룹 2PM이 재범(박재범) 없이 6인조로 극비리에 최근 뮤직비디오 (2PM 'Without Jaebeom, returns on the 2nd, Fans wonder about tracks) Newsen. 2 November 2009. (in Korean) '6인조' 2PM, 수능날 Mnet '오 굿 콘서트'로 컴백 Archived 16 November 2009 at the Wayback Machine.. E-Daily. 11 November 2009. Retrieved 14 November 2009. (in Korean) 2PM MAMA 대상 올해의 가수상 눈물펑펑 "재범과 영광 함께할터". Newsen News. 21 November 2009. Retrieved 27 November 2009. (in Korean) 2PM, MAMA 재범 위한 특별 퍼포먼스 뜬다. Newsen News. 21 November 2009. Retrieved 27 November 2009. (in Korean) 재범없는 2PM, 뮤뱅 K차트 1위 방송 첫 정상 등극 기염. Newsen News. 27 November 2009. Retrieved 27 November 2009. (in Korean) 2PM ‘어겐앤어겐’ 시청자 뽑은 최고가요상. Newsen News. 31 December 2009. Retrieved 9 January 2010. (in Korean) JYP "재범 한국비하보다 더 심각한 문제로 계약해지. 소속연예인 적합치 않다". Newsen News. 25 February 2010. Retrieved 25 February 2010. (in Korean) 2PM, 뮤비촬영 완료...'짐승'출격 시동. Nate News. 9 April 2010. Retrieved 23 April 2010. WONDER GIRLS WORLD TOUR 2010 Archived 12 August 2010 at the Wayback Machine.. Wonder Girls official website. 5 April 2010. Retrieved 23 April 2010. (in Korean) Korea Times Music Festival Official Facebook Profile. 16 April 2010. Retrieved 23 April 2010. G-Market Dream Concert Line-up Announcement. Retrieved 23 April 2010. 2PM releases world cup song. Retrieved 22 December 2010. "'컴백' 2PM, 온라인 음악사이트 석권..수록곡도 '인기'". Asia Economy (in Korean). 19 April 2010. Retrieved 20 April 2010. K-chart list K-Chart List.www.kbs.co.kr. Retrieved 23 December 2010. Billboard Charts World Albums Gainer. Retrieved 29 November 2010. MMH 2010 Award. Retrieved on 26 November 2011. "Archived copy". Archived from the original on 31 December 2014. Retrieved 31 December 2014. 2PM's new Japanese Single "Take Off". Archived 2 December 2011 at the Wayback Machine. Retrieved on 21 April 2011. 2PM reveals teaser photos for their "Hands Up" comeback! allkpop. Retrieved 17 June 2011. Comeback Alert: Put Your Hands Up for 2PM. mtvk.com. Retrieved 17 June 2011. 2Pm released trailer for their documentary film. "2PM release "Come Back When You Hear This Song" trailer". Allkpop. 2 May 2013. Retrieved 7 May 2013. "2PM pre-release "Come Back When You Hear This Song" + 10 songs from 'GROWN'". AllKpop. 5 May 2013. Retrieved 7 May 2013. "2PM opens 2PM Zone at Apgujeong Rodeo Station". Star News. 2 May 2013. Archived from the original on 8 August 2014. Retrieved 13 May 2013. Choi, EunHwa (16 May 2013). "Shinhwa, 2PM and Seo In Young to Make Comebacks in This Week′s M Countdown". enewsWorld. CJ E&M. Retrieved 21 May 2013. "A fire starts during 2PM's new MV filming - allkpop.com". Retrieved 26 September 2017. "2PM reveals teaser images for 'GO CRAZY!' comeback - allkpop.com". Retrieved 26 September 2017. "2PM 'GO CRAZY' in individual teaser images - allkpop.com". Retrieved 26 September 2017. "jypentertainment". YouTube. Retrieved 26 September 2017. Lim Jeong-yeo (15 June 2015). "2PM's 'My House' launches with music video". K-Pop Herald. Retrieved 23 June 2015. "Instagram post by REAL JUNHO LEE • Sep 3, 2016 at 3:29pm UTC". Instagram. Retrieved 26 September 2017. "Update: 2PM Drops Album Spoiler For "Gentlemen's Game" - Soompi". www.soompi.com. Retrieved 26 September 2017. "2PM Shares What They'd Like To Do Together Before Enlisting - Soompi". www.soompi.com. Retrieved 26 September 2017. "2PM Members Re-Sign With JYP Entertainment | Soompi". www.soompi.com. Retrieved 2018-02-02. "2PM Members Appointed As Directors Of JYP Entertainment | Soompi". www.soompi.com. Retrieved 2018-02-02. "2PM 데뷔 3개월만에 버라이어티 MC 발탁" (in Korean). Newsen. 2 December 2008. Retrieved 16 August 2009. "2PM's Jaebeom disgraced Korea; program delayed indefinitely" (in Chinese). Sohu. 11 September 2009. Archived from the original on 13 November 2009. Retrieved 1 October 2009. "2PM 팬사인회 22일 개최 '명동에서 만나요!'" (in Korean). Newsen. 8 February 2009. Retrieved 16 August 2009. "2PM meets Thai prime minister". The Korea Times. 6 July 2009. Retrieved 13 July 2009. "Thai Tourism has a New Face". eTurbonews. 2 August 2009. Retrieved 16 August 2009. "2PM, 60개국 아동인권보호 캠페인 국내 홍보대사". Asiae (in Korean). 5 August 2009. Retrieved 16 August 2009. (in Korean) 김태희-2PM CF 동반출연 네티즌 반색 "선남선녀 환상의 조화" Newsen News. 25 November 2009. Retrieved 27 November 2009. (in Korean)2PM 애니콜 신규모델 발탁 ‘연하남+짐승돌’ 상반 매력 발산. Newsen News. 26 November 2009. Retrieved 27 November 2009. (in Korean) 김태희-2PM CF 동반출연 네티즌 반색 "선남선녀 환상의 조화". Newsen News. 25 November 2009. Retrieved 27 November 2009. (in Korean) 2PM 광고계 접수..휴대폰·식음료 이어 ‘스프리스’ 의류 모델 발탁 Newsen News. 4 January 2010. Retrieved 9 January 2010. SNSD and 2PM's Caribbean Bay CF released. Retrieved 22 December 2010. 2PM & SNSD release Caribbean Bay song. Retrieved 22 December 2010. (in Korean)소녀시대 유리, 머리카락 넘기는 모습도 '섹시' Archived 22 January 2011 at the Wayback Machine.. freechal. Retrieved 22 December 2010. (in Korean)소녀시대-2PM ‘캐비’ M/V서 섹시한 라이프가드로 변신. newscj. Retrieved 22 December 2010. Nickkhun missing from 2PM's new single "Fly to Seoul". Retrieved on 22 December 2010. 2PM's Nori Anycall-MV revealed. Retrieved 22 December 2010. "2pm". www.facebook.com. Retrieved 26 September 2017.